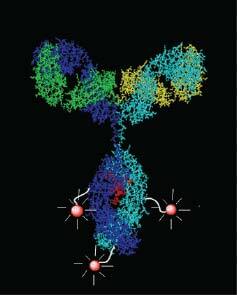 Label 5 to 100 mg of an Antibody with the Brightest Dyes in 30 min — It’s a Revolution! Simply mix your antibody with our superior CF™ dye in the provided buffer for 30 min and now you are ready to stain your sample. No more gel filtration or dialysis! No need to remove sodium azide or Tris from your antibody solution before labeling. BSA or gelatin, if present at low levels, can also be tolerated. Mix and then Stain- It is really that simple! Mix-n-Stain™ CF™ dye antibody labeling kits dramatically simplify the process of preparing fluorescently labeled antibodies, particularly primary antibodies. 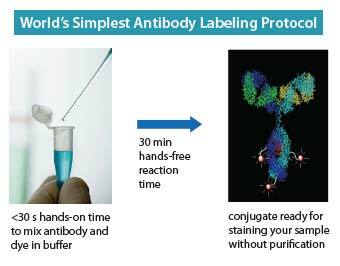 Simply mix your antibody with a CF dye of your choice in the buffer provided, a step that takes less than 30 seconds of hands-on time. 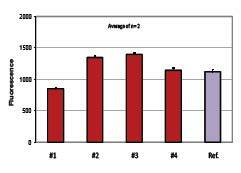 After waiting for another 30 minutes, and without a separation step, you will have a fluorescent antibody conjugate that is as good as the best pre-labeled fluorescent antibody you can buy from some of the leading suppliers. There is no need to calculate how much dye you should use; just mix your antibody with the entire amount of dye provided and you will always produce optimal labeling. Moreover, the labeling reaction can tolerate the presence of common stabilizers, such as sodium azide, Tris, and low levels of glycerol, BSA or gelatin. Another major advantage of the labeling kits is our superior CF™ dyes, many of which are brighter and more photostable than Alexa Fluor® dyes and other similar commercial dyes. With a large list of CF™ dyes of wavelengths spanning the entire visible and near-infrared spectra, you have unprecedented freedom to label any commercial primary antibody with a color of your choice, making multi-color detection simple and affordable. Visit the Biotium website for details on CF™ dye technology. With more than 20 CF™ dyes available, multi-color detection is now only limited by your instrument capability and your imagination. Figure 1. Flow cytometry analysis (on BD FACS Calibur) of Jurkat cells stained with various CF™633-labeled mouse anti-human CD3 antibodies. The fluorescent antibody conjugates were prepared from different amounts of the unlabeled antibody (BD cat# 555330) and matching labeling kits as detailed in the above table. For comparison, cells were also stained with commercial mouse anti-human CD3 pre-labeled with Alexa Fluor®647 (BD cat# 557706). Figure 2. 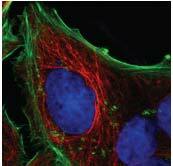 HeLa cells were stained with b-tubulin IgM conjugated with CF™633 Mix-n-Stain™ (red), followed by CF™488A phalloidin (green) and DAPI (blue). Images were captured on a Zeiss 510 Meta Confocal microscope. Mix-n-Stain™ and CF™ are trademarks of Biotium, Inc. CF™ dye technology is covered by pending US and international patents.